Rajapaksa on October 12. In an exclusive interview with the Sunday Observer, Yogeswari Patkunaraja outlines her vision for Jaffna. Q: You have been elected as the Mayoress of Jaffna. How do you see your new position? A: First of all, I thank my people for electing me as their Mayoress.The Jaffna Municipal Council, which is one of the oldest Local Government bodies in Sri Lanka, had been defunct for more than two decades. Three Mayors, Alfred Duraiyappah, Sarojini Yogeswaran and K. Sivapalan were assassinated by the LTTE.The majestic Jaffna Municipal Council building, which was identical to the Jaffna Public Library, was also blown up by the LTTE in the early eighties. Now, with the end of LTTE terrorism,the city of Jaffna and the entire Northern Province have to be rebuilt to regain their former pristine glory. Therefore, as the new Mayoress of Jaffna, I see there is a huge task lying ahead of me in rebuilding the city of Jaffna which was known to be a clean and highly cultured city in the good old days. Q: What are your priorities as the new Mayoress of Jaffna? A: There are several. Jaffna was a `ghost city’ for the past three decades. The Municipal Council limits of Jaffna had suffered severely due to the war. A large number of heritage sites including the Dutch Fort, schools, hospitals, business establishments, houses, streets and places of worship were damaged. There was also a large scale loss of lives. However, with the return of peace, we have to bury the past and energise ourselves to rebuild Jaffna. Rebuilding the old Jaffna Municipal Council building to its precise old structure along with giving a facelift to the Jaffna market complex and reconstructing the damaged canals and drainage system are our priorities. During the tenure of late Mayor Alfred Duraiyappa, a plan was worked out to build a modern market complex in Jaffna. Before the completion of the plan, Mayor Duraiyappa was assassinated. Since then the Jaffna city began to deteriorate in every way. But now, with the return of peace, the new Municipal Council administration under me will continue to go ahead with new plans and ideas to design a new Jaffna retaining its old values. Q: Could you elaborate on the setbacks faced by the Jaffna Municipal Council during the dark period which haunted the entire peninsula for the past three decades? A: First of all, there was no proper Municipal Council administration. Several areas which remained under the purview of the Jaffna Municipal Council were in negligence. A fear psychosis reigned with explosions and clashes within the Jaffna city limits. People were scared to come to the Jaffna city even for medication, banking, schooling or to make purchases. I would say the entire city was in total mess with huge pot holes on the streets and bunkers built for civilians to take cover in case of any untoward incidents. There was not even any entertainment such as cinemas or cultural and sports events within the Jaffna city like what was experienced three decades ago. So I would say that this period was like a hell in every aspect in the life of Jaffna citizens, with deaths and destruction occurring every now and then. Q: As a prominent Jaffna citizen, how do you see President Mahinda Rajapaksa’s victory over LTTE terrorism? A: The victory over terrorism has made Jaffna see the light at the end of the tunnel! The people of Jaffna, especially the younger generation, was deprived of many good opportunities due to the conflict situation. The entire North was traumatised. But now, with the end of war, new vistas have opened for the Jaffna youth. They could now look forward to pursue their interests in various fields and enhance their lives. President Mahinda Rajapaksa has highlighted his statesmanship by utilising all his resources in rebuilding the North. We appreciate his efforts in creating a new era in Jaffna. Q: Being a person who had seen the worst period in Jaffna, do you have any personal experience with regard to the turbulent days? A: Like the others in Jaffna, my family and myself also suffered a lot during the darker days.We had to find shelter inside the Nallur Kanthaswamy Kovil along with thousands of others when the Indian Peace Keeping Force embarked on their operations against the LTTE.Later in 1994, the whole of Jaffna was forcibly evacuated by the LTTE and we were made to walk several miles towards Chavakachcheri in the Thenmaratchi region. It was horrible. Women, elders and children suffered immensely and some of them died while they were heading towards Chavakachcheri. Q: The areas in Jaffna where the Muslims were domiciled were also badly affected when the LTTE forcibly evicted them in the early eighties. As the vast Muslim population in Jaffna remains within the Jaffna Municipal limits, how is your new administration going to address their grievances? A: We are in the process of protecting the immovable assets of Muslims in Jaffna.There was an incident recently when a person was attempting to purchase a property in the Muslim area. We found that his attempt was illegal and our timely action prevented the deal.So we have taken every measure to ensure the safety of the Muslims once they begin to rebuild their lives in Jaffna. Q: What is your assessment on the post-war rehabilitation and reconstruction activities in the North? A: I would say the entire process is progressing in a remarkable way. Restrictions for fishing in the northern seas have been removed and the farming community has also been encouraged with their products going out of Jaffna for good prices. Trading activities have been launched and essential food items are now flowing into Jaffna following the opening of the A-9 highway. Earlier the prices of essential commodities had sky-rocketed. Now we could buy whatever items we want at very reasonable prices. The Minister of Social Services Douglas Devananda also played a very commendable role in ensuring the flow of essential items into Jaffna, not only during the post-war period, but even during the dark days.As far as the reconstruction activities are concerned, under the `Vadakkin Vasantham’ (Spring in Jaffna) program, plenty of constructive things have been implemented. Ministers and officials representing various ministries are visiting Jaffna on and off and we are very happy to see that they are making genuine efforts in rebuilding the North. Q: The Tamil National Alliance (TNA), which was once known as proxies for the LTTE, is the main opposition party in the Jaffna Municipal Council. What is your message to them? A: Well, we cannot live in the past. We have to charter a new path for our future generations. It is time for us to think constructively. We should make a collective effort in reaching our goals. Instead of dabbling in petty politics we should act with a broader outlook to regain the lost glory. The opposition members of the TNA have pledged their support for the new Jaffna Municipal administration and we look forward to greater cooperation from the TNA. Q: Since you are going to be the first post-war Mayoress of Jaffna, could you say something about yourself? A: Well, I am from Nallur, Jaffna. I was an old girl of Vembadi Girls High School, Jaffna and I had the privilege of studying during the period of the late Mabel Thambiah and Ms Arumugam as principals. The late Jaffna Mayoress Sarojini Yogeswaran, was also my teacher at Vembadi. 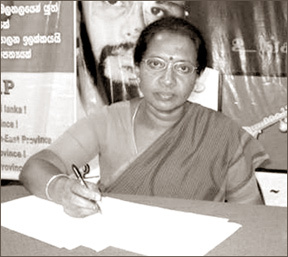 She was assassinated by the LTTE, the outfit which even gunned down her husband and Jaffna Parliamentarians V. Yogeswaran along with the TULF leader A. Amirthalingam in the early nineties. My mother Mrs. Annapoorani Somasundaram was a Director of Education and my father `Kalabooshanam’ A. Somasundaram was also a teacher. My husband Patkunaraja is a planning officer at the Jaffna Municipal Council and he is now my Personal Assistant. I have two sons and they are students of Royal College, Colombo. I graduated from the University of Peradeniya with an honours degree in geography. I am an M.Phil holder with a Diploma in Education.I was a teacher by profession and taught at my alma mater until my entry into politics.